Den nydelige blonden og pyntebær kommer fra Kort & Godt Hobby. wow, your blog I found straight with to browse by the www, am I speechless from such beautiful work. everything so beautifully, is hardly to be believed, I must absolutely still further on yours blog look around. I place before envy, because you such beautiful hires make. mean respect. all dear for the year 2010 and much creativity. what a gorgeous card and such pretty flowers. 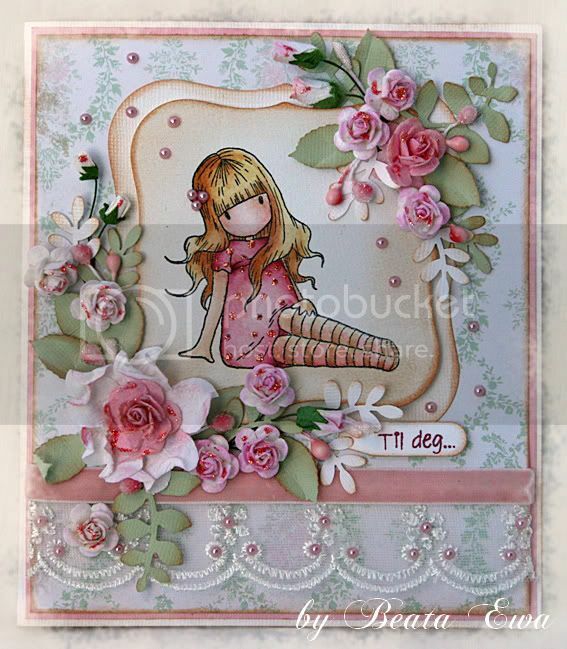 Gorgeous card, love this card!! Ooooh, such a lovely card, Beata! I love it. papers, details,image, your colouring…all is perfect. Det er en fryd å kikke innom bloggen din. Du er fantastisk flink og en stor inspirasjonskile! Dette kortet var rålekkert! Ønske deg ei flotte helg! This is so beautiful!!!!!!! I can't take my eyes off of it! Hola Beata, como siempre tus trabajos llaman mi atencion por la elgancia de sus detalles. Hi Beata, as always your work to get my attention by the elegance of its details. Så ufattelig lekkert!! Nyydelig fargelagt, design og fantastiske detaljer!!!! Det er bare sååååå lekkert Beata. Восхитительно!!! Потрясающе красиво!!! Просто супер!!! Ooh Beata - the lace is sooo pretty with the pearls on it!!! Utrolig lekkert og delikat Beata!! Oh, this is so wonderful Beata! I love this image and papers and colours are beautiful.